Key Stage 2 (Classes 3, 4, 5 and 6) children must pay their dinner money £9.75 per week on a Monday morning. When a child is bringing dinner money, it must be placed in an envelope, clearly labelled with their name and amount enclosed. Parents may pay for the term or half-term if they so wish. Children entitled to free meals are treated in the same way as those paying and are unidentifiable, except to the Headteacher and School Office staff. 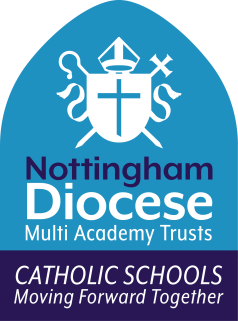 For information about Free Meals entitlements please visit https://www.nottinghamcity.gov.uk/education-and-schools/benefits-for-school-aged-children/contact-pupil-benefits/ or telephone Pupil Benefits on 0115 915 4084. School meals are healthy, nourishing and excellent value. A salad bar is available every day. Children are encouraged to partake of all meals, unless there is a medical reason for them not to have certain foods. In that case, please notify the School Office. All efforts are made to meet requirements for health and other reasons. The meal is served ‘Cafeteria style’ and all children are encouraged to use a knife and fork properly. Grace is said in Class before and after the lunch break. All packed lunch children are expected to conform to the healthy eating requirements set out by the DFE. No crisps or sweets or chocolate are permitted. Water is provided on specific request. It is a condition that all children who remain at school during the lunch break behave in a reasonable manner. NOTE: In accordance with LA recommendation, parents are requested to restrict any alterations to the children’s lunchtime arrangements to holiday times. Our school provides a milk scheme that is available to all our pupils in Key Stages 1 and 2 – you will need to register your child. School milk is free for under 5’s, and for over 5’s it is available at a subsidised* price of around £15.00 a term. Each child that registers with Cool Milk will receive a 189 ml portion of semi-skimmed milk every day, delivered fresh and chilled to the classroom. Their school milk will not only provide them with essential nutrients, but as it is rehydrating and energy boosting it also bridges the gap between breakfast and lunch to help children stay focused. For more information on how milk can benefit children visit www.coolmilk.com/why-milk-is-great. Pupils eligible for free school meals will receive free milk and will be registered with Coolmilk by the school. Register online at www.coolmilk.com or complete the registration form attached. Free milk will continue until the Friday before your child’s fifth birthday. You will receive a payment request four weeks before their birthday – if you wish your child to continue to receive school milk, simply make a payment. Please pay by a Tuesday at 5pm for your child’s milk to start the following week. Children are not allowed to bring crisps, sweets or chocolates of any kind into school. The one exception to this rule is on the day of a child’s birthday, if they wish to share with their class. This is done under the supervision of the Class teacher. Children are allowed to bring drinks of water to school. Water is readily available throughout the day from sources of drinking water situated around the school. All bottled drinks must be securely fastened. Glass bottles must not be used. Being part of the National Fruit for School Initiative, all our Foundation Stage and Key Stage 1 children receive a piece of fresh fruit every morning break time. We have a ‘Healthy Tuck Shop’ run by the Local Authority Catering Department each morning break for the children in Key Stage 2.